Percent +1H tells the percentage of all spectra ions with a charge of +1. 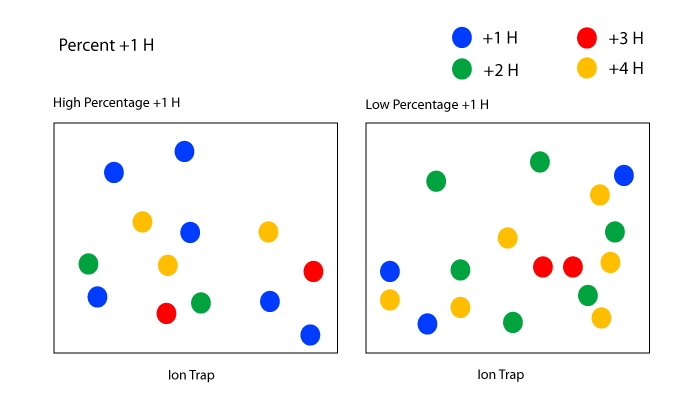 Higher percentages of +1H spectra may indicate inefficient ionization in the electrospray. Percent +1H is calculated by looking at the charge state of all spectra that match to a peptide. A high Percent +1H means that there are an unusual number of +1 ions. This might mean that the peptides are not ionizing efficiently and so are not getting doubly charged as is normal in electrospray. It might also mean that a large number of polymer or other contaminate ions are in the sample. These molecules may preferentially ionize as charge +1. Large Percent +1H means that the other charge states don't get as many ions. The metrics Percent +3H and Percent +4H also report the ion's charge state. Any ions that are not charge +1, +3, or +4 are probably charge +2.